UIC workers picket for end to wage discrimination | Fight Back! 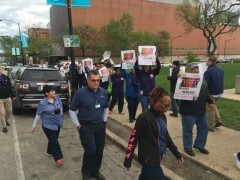 Chicago, IL - On May 1, over 250 workers at the University of Illinois at Chicago (UIC) picketed to demand a fair contract. Many members of the Service Employees International Union (SEIU) Local 73 have been without a contract for almost two years. In February, the University of Illinois campus in downstate Urbana-Champaign, settled with Local 73 members there for a three-year deal with modest wage increases in each year. UIC workers are being offered a wage increase in only one year of a four year contract. This is despite the fact that the cost of living is higher in Chicago. Samella Wright, an administrative worker, was picketing because of the history of a racist pay disparity at UIC. When UIC opened in 1965, the mainly Black workers were hired at wages $1 or $2 an hour less than the mainly white workers in Urbana-Champaign. SEIU Local 73 fought for years to win pay equity with Urbana, finally winning in 2001 for most job titles. Ms. Wright started working at UIC right out of high school in the early 1970s. By the time her title re-ceived parity with her Urbana counterpart, she had worked 60,000 hours at the lower pay rate. When the UIC workers finally gained the Urbana pay grade, there was no back pay in the agreement. More than 4000 workers are covered by the four expired contracts. Bargaining will continue in the coming days with a federal mediator.